This Tequila Sunrise is made with homemade grenadine which is much better than the store bought bottled stuff, and it’s so simple to make! I thought it would be fun to revisit some retro cocktails every now and again. So to start it off, I made a Tequila Sunrise. Am I wishing I was still in Mexico enjoying the sand, surf, and warm weather? Most likely! However, I think the real inspiration for making this tequila sunrise is because I made homemade grenadine and now it was time to make a drink with it. Real grenadine is not that bright red, syrupy, overly sweet stuff you get in the store. Have you ever read the ingredients label? It’s basically high fructose corn syrup and chemicals. Real grenadine actually has fruit! As in pomegranates. Yes, I know it still has sugar. It’s basically a simple syrup made with pomegranate juice instead of water. And since pomegranates are naturally tart, you’re gonna have to use a bit of sugar. However, when you make your own grenadine you can control the amount of sugar you add. I like to think that since I’m using real pomegranate juice, that there’s some redeeming value to making it homemade and there’s nothing artificial in it! Homemade grenadine has a deep red color and really doesn’t taste anything like the bottle of store bought stuff. It’s much better! Try it on pancakes or ice cream. So back to the Tequila Sunrise. It’s basically orange juice, tequila and some grenadine. That’s it. I like to squeeze some lime juice in mine, but you don’t have to do that. The grenadine will sink to the bottom of the glass and with the graduation of color it’s suppose to look like a sunrise (or sunset?). You can give it a bit of a stir if you want it to mix more. 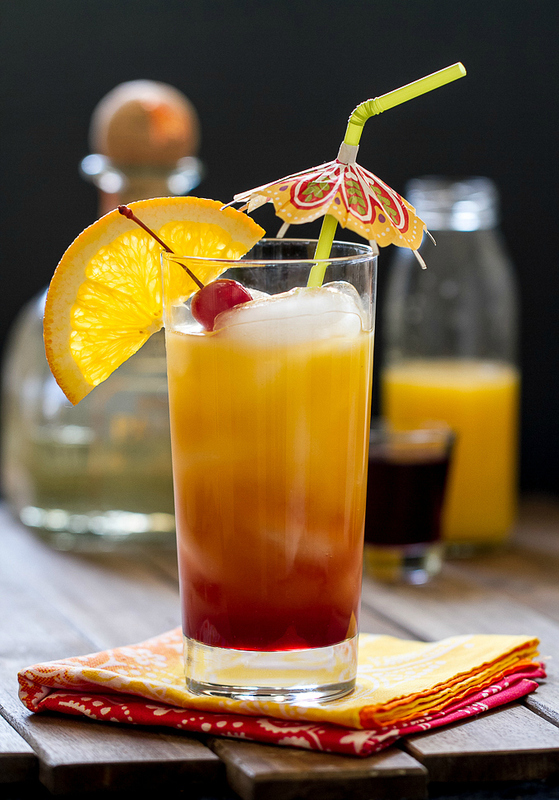 So how about giving a good ol’ retro drink like a Tequila Sunrise a try next time you’re having brunch? It has orange juice in it after all. No reason Mimosas and Bloody Marys should be the only drinks consumed at brunch! In small saucepan, combine pomegranate juice and sugar. Bring to boil, reduce heat and simmer about 15 minutes until liquid is reduced and thickened a bit. Set aside to cool, store in refrigerator. In cocktail shaker, combine tequila and orange juice. Pour in tall glass filled with ice. Slowly pour in grenadine and let it settle to bottom for a layered look. Or stir to combine if desired. Sharing this drink at the Tipsy Tuesday and Hopelessly Ever After link parties this week! You always have the best cocktail recipes! You have so many I’d love to try, and honestly if I was throwing a cocktail party, I’d come here first for recipe ideas. Pretty shot. I love that umbrella. Also, how did you manage to write this post in this midst of traveling and painting?! Thanks! Love trying a new one each week. I have a few posts I did before I left for this and next week while I’m slaving away at the condo! Thanks for the grenadine recipe, it sounds like it would make this better. On the wagon right now to lose some Christmas weight, but I can’t resist looking at your drink recipes. That looks fantastic. Going to have to pin this one! This sounds amazing. I am going to have to try this one day. How crazy is it that I never knew how to make a tequila sunrise? I thought it was much more complicated than that. So happy you shared the recipe. I would love to make my own grenadine. I’ll definitely be pinning this for later use!! I can’t wait until it’s summertime!! If you can, stop by and link this post up for Thursty Thursday today!! I’ve never made one before either! And never realized how easy it was to make homemade grenadine! I’ll go stop by and link up…thanks for stopping by. Thanks for linking up to Tipsy Tuesday! Homemade grenadine is the yummiest…and drinks really don’t get prettier than the Tequila Sunrise! We’re hosting a cocktail link-up today, would love for you to stop by and share this!